Unfortunately we are currently unable to take tandem bookings. However, we are still running First Time Jump (FTJ) courses to you can learn to skydive on your own. The FTJ course will give you an incredible sense of achievement at a more affordable costs than doing a tandem. If you are interested in doing our First Time Jump (FTJ) course but have questions before you book, please contact us. NOTE: You DO NOT need to do a tandem before attending our First Time Jump (FTJ) course. In fact many experienced skydivers have never done a tandem. A tandem skydive is the ultimate way to experience the thrill of freefall with minimal preparation. You will receive an intensive briefing including an introduction to the equipment that will be used, and how it works and what to expect during your skydive. Then your instructor will assist with the fitting of your harness, take you out to the aircraft, and take care of all the work while you experience a thrilling 40 second freefall from 11,000ft. A tandem skydive does not give you a license to jump but it will get you hooked on skydiving. If you want to take the sport further you will need to attend our First Time Jump (FTJ) course, which is run every other weekend. Skydive Robertson is the only dropzone in the Western Cape that lets you have a third person to video and take pictures of you while you skydive; all other dropzones just stick a handycam on the wrist of the tandem instructor. Your camera flyer will film you before, during and after your skydive and present you with your commemorative video when you leave. Tandem parachuting allows you to experience the thrill of freefall skydiving without any extensive training and is our most popular skydiving course. After your tandem tandem briefing, you will jump harnessed to the front of a fully qualified tandem instructor and jump from 11,000ft. From this height, you will enjoy an adrenaline-fuelled freefall reaching terminal velocity at 200 kph. When you land you’ll receive a Tandem Certificate signed by your instructor. After you’ve booked your tandem parachute jump, you will be given a confirmed arrival date/time. 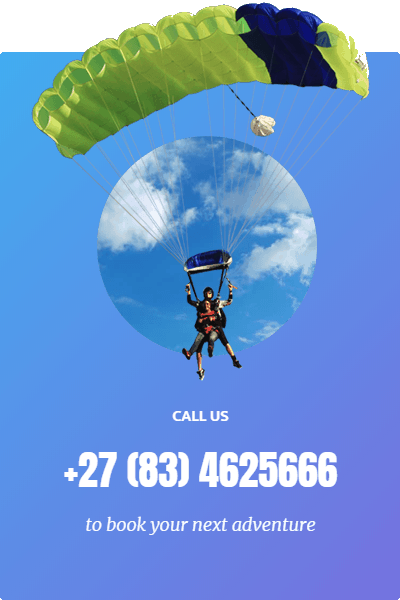 When you arrive at the dropzone you’ll need to register with manifest, then you venture into the world of parachuting. Incredible experience with incredible people. A MUST! Awesome people…….awesome club………thanks for the great weekend guys. What an amazing weekend. Perfect/crazy people, place, instructor, club, everything. Besides for the clouds but they disappeared. Big thanks to everyone, I will be seen you soon. 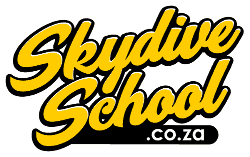 The team of Skydive Robertson is excellent, really friendly and super professional. I highly recommend to jump here, particularly if it is your first time. Thank you Pam for the logistics and Tim for taking away my fear! One of the best experiences of my life. Don’t think too hard, just go for it. Something very special happens up there! Had a fantastic experience for my first time skydiving with you guys, will definitely see you guys again soon. I need a 10⭐for you guys. AWESOME is so underrated!!!. I will be back. The MOST amazing experience ever!!! What an awesome experience! Thank you Timmy and the team! Dress for the weather (normally it is 10 colder at altitude than it is on the ground). Membership Form: This grants you temporary membership to the club. Parental Consent Form: If you are under the age of 18, a parent and/or guardian will need to complete this form. To take either a handycam or camera flyer option, you can choose one of the additional package options when you book. Each booking will require a non-refundable R500 deposit before a booking is confirmed, but the balance can be paid on the day of your jump.